Get Lync News in Your Inbox! Lync News 2.2 Released – Jetzt auf Deutsch! I just got the e-mail from Microsoft that version 2.1 of Lync News has been approved. It should show up sometime in the next 24 hours as an update in the Marketplace. The direct link to download the app is right here or check the Marketplace for the update if you already have it installed. The major new feature is multi-language support or, more specifically, being able to support multiple xml files which drive the GUI option within the app. 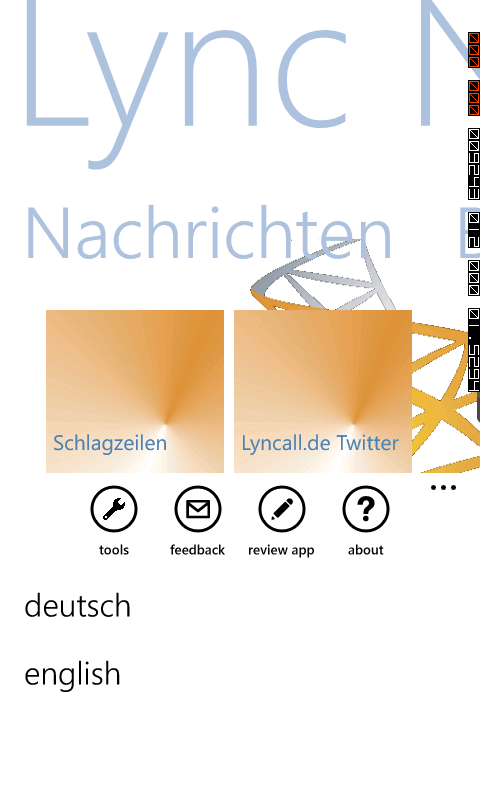 At this point, that feature is exposed via support for a German version of Lync News. Ich brauche Hilfe. Da sind sicher mehr RSS Feeds als was ich finden konnte. Wenn sie von andere Lync blogs wissen, bitte shicken sie mir ein e-mail mit die infos. Please contact me about having the app display feeds in your native language. As I am decent with the German lanugage, I’ve started there but it’s no reason why more language cannot be added. In short, I’ll need a list of blogs and their RSS feeds as well as some somple translation of the GUI. Finally, one or two new blogs have been added to the blog lists. So far, Lync News has been downloaded 4,517 times.